I'm looking for the contact information for the A-C rear brake and brake rod kits. From what I've seen there are two people who reproduce,one does the brake shoe part and the brake rod and hardware is done by someone else. Does anyone know if installation instructions are included? This will be my 2018 spring/summer Model T project. In addition to inspecting and installing missing cotter pins and proper hardware and inspecting front and rear hubs. Already know that I have a leaking left rear oil seal. Fingers crossed I'm not opening Pandoras box. John google "mtfca; ac brakes" sit back and read up and enjoy. There has been a lot if info posted over the past few years. I am suggesting googling because there has been so much info posted not because we do not want to help. If you scroll through this post you will find some detailed "tips" on installation that I posted that includes some pictures. My post is March 19 at 09:33 am. The original style repop AC brakes I bought had cables instead of rods. I eventually fabricated rods for them. Thank you Bill Ramsey! I have a set of ACs ordered and will follow your suggestions. I hear that getting all of this adjusted so everything works together is tricky. Can anyone provide guidance? Bill Ramsey thanks,that was what I was mainly looking for, contact information. Just to be able to get the brakes and linkage ordered. I have no doubt that the posts will guide me through the horrors of the installations and any other issues the guys in the club will get me the rest of the way. 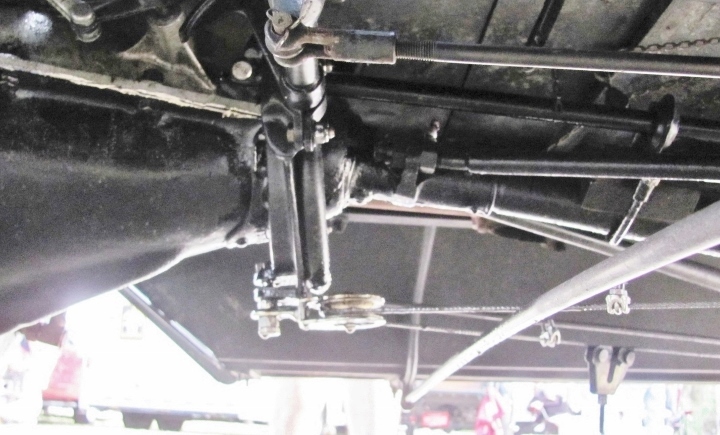 Hopefully this will be a great year for me and my Model T.
AC brakes used a cable instead of rods. I can't understand why anyone would want to change that function. Same thing with Rocky Mountains. With rods, adjustment stays put. 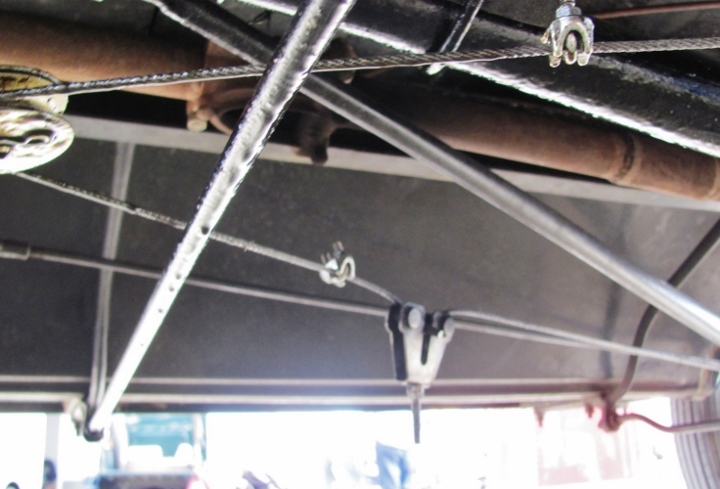 Cables can stretch so some type of spring tension is needed, or in this install of small drum 'AC -type' external brakes, the owner put in a cable tensioner. 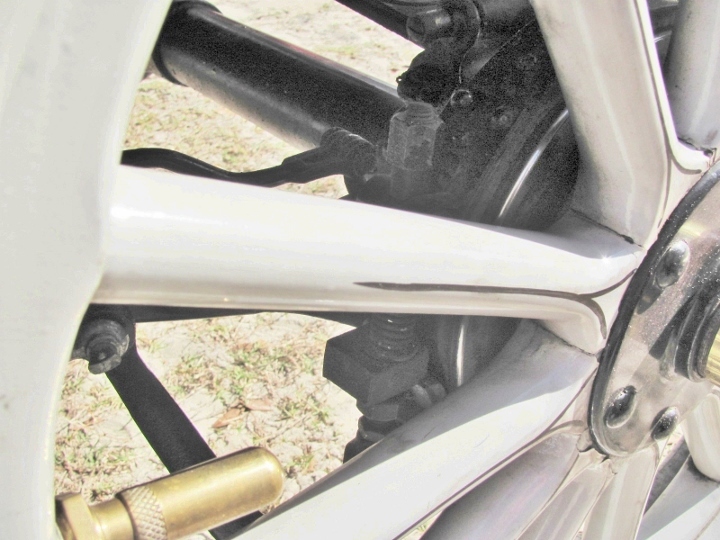 'Floating' equalizer bracket allows the external brakes to be applied when pulling back the clutch/emergency brake lever for double braking, a good idea IMO, the modern Rocky Mtn. brakes use this method. Hello all, it's my understanding that the Rich Baughman linkage kit uses rods and not cables. McMaster Carr has 3/16" cable that won't stretch. David: "Never saddle a dead horse"
David and Dan are correct: Never saddle a dead horse. Meaning; the end of the cable is named the dead end, do not use the saddle on the dead end. Easy to remember and anyone who has worked with cable and cable clamps is sure to know. I'm so confused... Which of the clamps show above is done correctly? 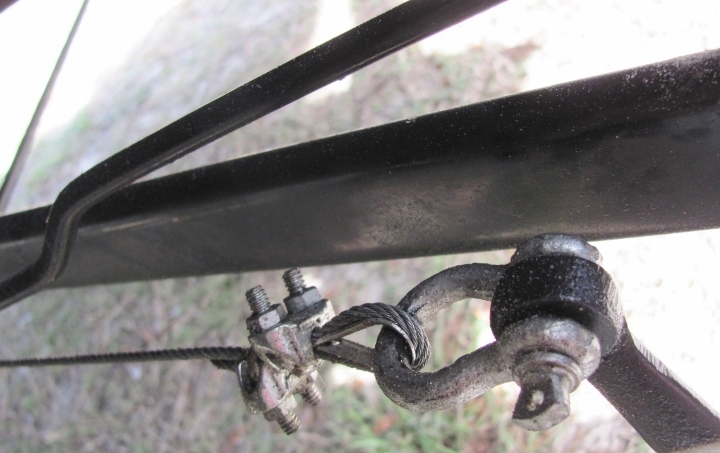 In the second photo, the first clamp, nearest the clevis(shackle), in on correctly. The farthest clamp, up the cable, is on backwards. For this application, this in not a serious problem due to light loads on the cable and the lack of any bending of the cable around/over something. One of the worst things about cable; it rusts both INSIDE and outside. Usually, the inside will rust worse since it retains the moisture more than the outside. Sudden catastrophic failure can occur. When inspecting cables, it is necessary to open them up to see what is going on inside as well as on the outside. Remember; cables are a working machine and need periodic lubrication the same as your spring shackles or spindle bushings.